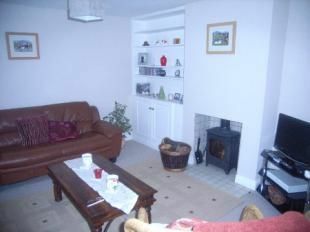 Well presented two bedroom townhouse with a benefit of off road parking for two vehicles. Briefly comprises lounge, separate dining room and modern fitted kitchen on the ground floor, two double bedrooms and a bathroom upstairs. entrance hall Double glazed door to front aspect. Stairs to first floor. Lounge12'11" x 12'11" (3.94m x 3.94m). Double glazed window to front aspect. Radiator. Log burner. Built in dresser. Under stairs storage. kitchen6'3" x 9'10" (1.9m x 3m). Comprises a range of floor and wall mounted units with wooden work tops. Inset sink and drainer. Built in slim line dishwasher. Space and plumbing for washing machine. Double glazed door to courtyard garden. Double glazed window to side aspect. bedroom one12'11" x 12'11" (3.94m x 3.94m). Comprises double glazed window to front aspect. Radiator. Ornate fireplace. Airing cupboard housing tank. Bedroom two9'10" x 10'6" (3m x 3.2m). Double glazed window to front aspect. Radiator. Built in storage. Bathroom10' x 6'6" (3.05m x 1.98m). Comprises double glazed window to front aspect. Panel enclosed bath with mixer shower over. Low level WC. Wash hand basin. Radiator. Tiled splash back. Rear Enclosed courtyard garden with shed, outside tap and lighting. Double gates through to parking bay for two cars. Travel directions From central Newport proceed into Upper St James's Street, take the first right into Chapel Street and then take the first left into Union Street. 1 Union Street is the first property on the left hand side.